I first became aware of Ararat when I received the first CD they recorded, Musica De La Resistencia as a promo freebee in a package of other CD’s I’d ordered. Figuring it to be a throwaway, I admit it took me awhile to listen to it, but when I did, wow, I was knocked out. I’m quite pleased to say that it’s follow up is knocking me out too! 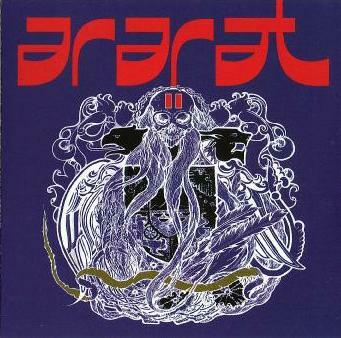 Ararat is the solo project of Los Natas’ Sergio Chotsourian. Los Natas is an Argentinian stoner rock band that is definitely not afraid to voyage into space territory. They did this especially on their Toba Trance releases, which consisted of lengthy, spaced out jams, filled with experimental noises, ambient drones and deep atmospheres. Most of their albums, however, tend more towards the traditional heavy riffs of the stoner genre. But it’s obvious that Chotsourian has a love of this more experimental kind of music because as Ararat, he explores it more deeply, also drawing in unusual elements such as Argentian folk music and avant-garde classical piano. The spacerock thing comes out straightaway with the thundering minimalism of the instrumental El Carro (The Cart), combining repetitive riffs with freaky sounds for some blistering Krautrockish times and the epic, 16-minute Caballos (Horses), with atmospheric synths riding along beneath raunchy riffs and tripped out vocals. But it’s songs like El Inmigrante (The Immigrant), with its strumming acoustic guitars, sounding a bit like a South American take on Hawkwind’s Down Through the Night; and Atenas (Athens), with its rumbling piano runs and distorted radio broadcasts that bring out the far reaching influences of Ararat’s music. My favourite though, has to be the 15-minute La Ira Del Dragon (uno) (The Wrath of the Dragon (One)). From its acoustic opening and closing to its intense, deeply heavy riffing layered with spooky effects, wailing voices and noisy space sludge; and Chotsourian’s snarling vocals, this is one freaky mindbender for the ages. The closer is Tres De Mayo, a powerful piano and guitar instrumental that again takes us into tripped out realms of mystery, leaving us there in some kind of delirious haze. This is adventurous and highly original stuff that finds its balance between the raunchy and the beautiful, the dark and the light. II is a worthy successor to Musica De La Resistencia, and in many ways is an even better album that first one.